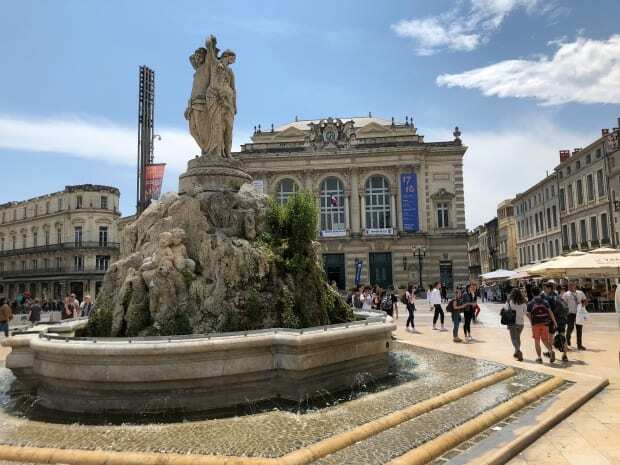 We flew into Montpellier via EasyJet as they were the only airline offering direct flights from London – that’s literally the only time I’ll fly EasyJet these days. 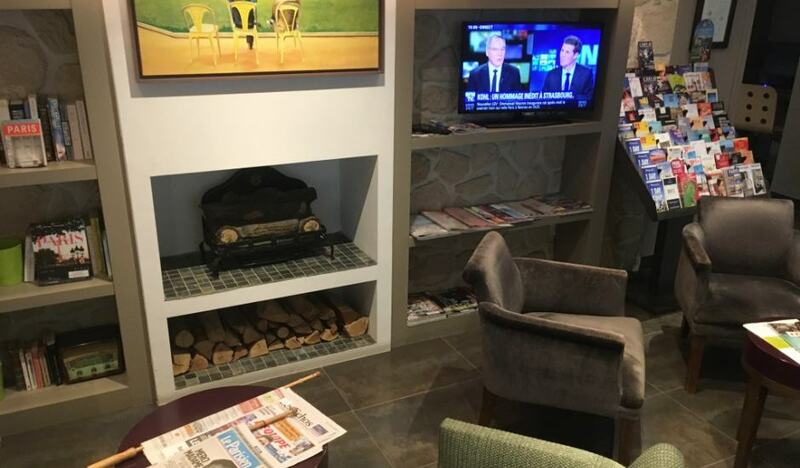 It was a balmy summer’s night when we landed and although it was an international flight, the smallness of the airport and the speed at which we were able to get through customs meant that it felt like a domestic one. 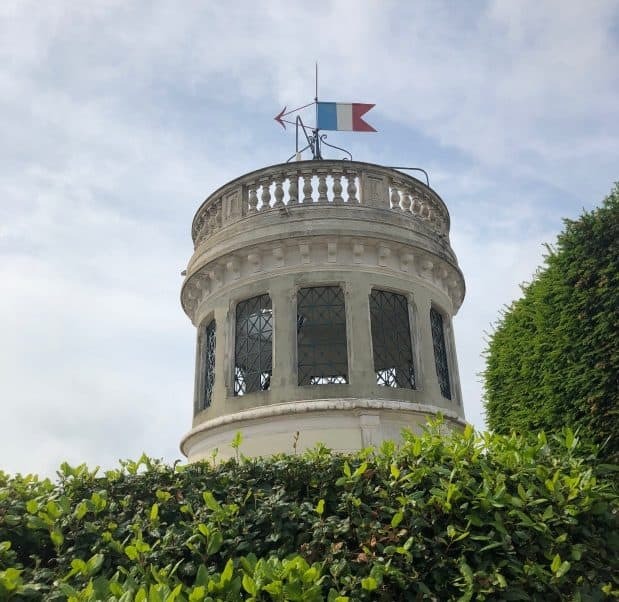 We were picked up by Ange’s brother-in-law’s father and the laid back French approach to life was immediately apparent as the car was parked in the middle of the single lane, blocking traffic and waiting for us. No one beeped or raised their voice – this was the pick up lane and everyone was here for the same thing. 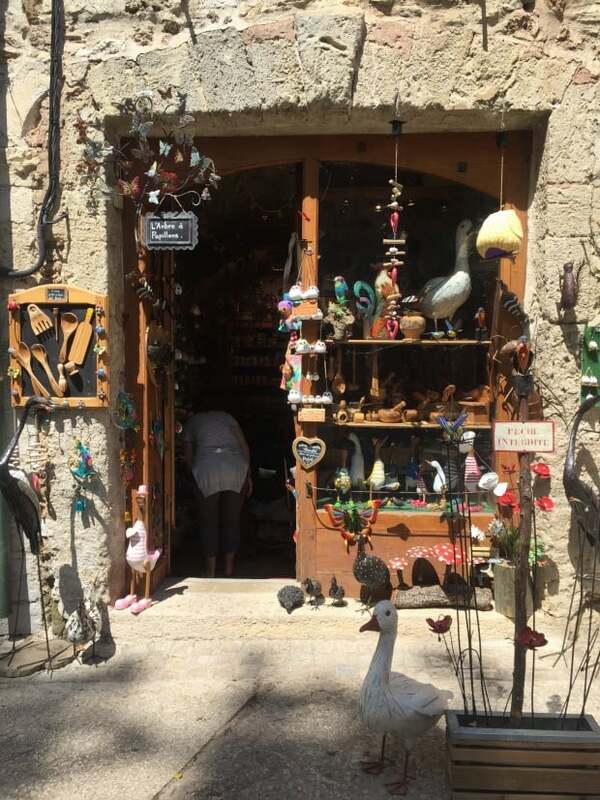 We shared a hurried greeting, got the suitcases into the boot and squeezed into the compact car before buzzing away through the rural streets from the airport to the town of Maugio. 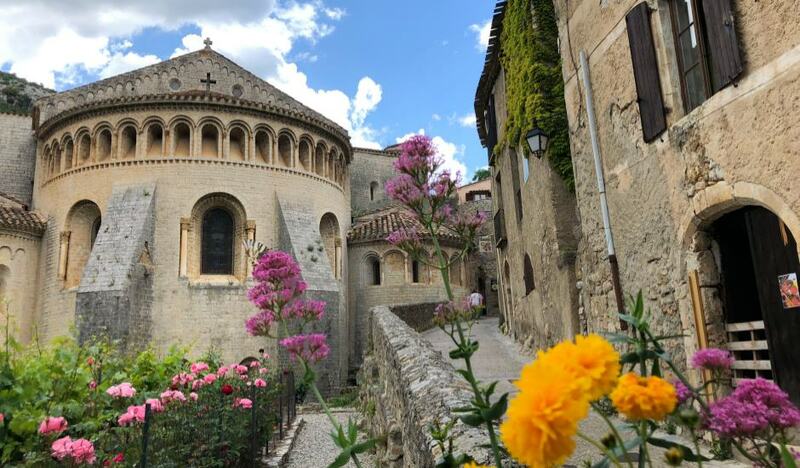 Maugio is a town with medieval links with maybe 18,000 occupants, separated from the much larger city of Montpellier by the latter’s airport, and separated from the Mediterranean Sea by a huge saltwater lagoon and miles of beaches. We were staying with Ange’s sister Tania, Tania’s husband Stephane and their one year old daughter Chloe in an AirBnB close to Steph’s family. Not long after arriving we took ourselves off to bed, eager for a good nights sleep in readiness for the next day. 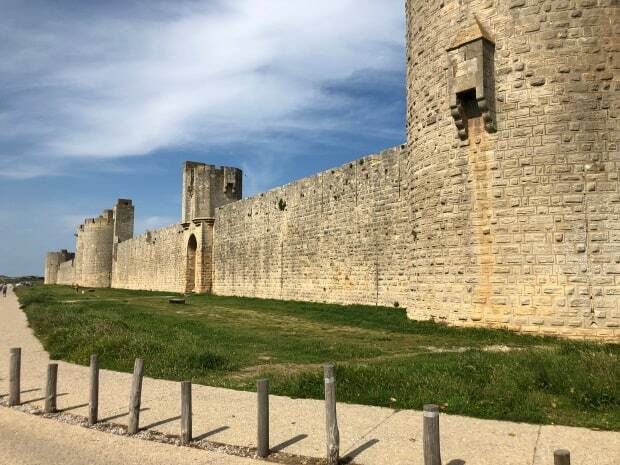 In the morning we all piled into the rental car and headed to Aigues-Morte. I got Stephane to repeat the name a few times to see how to say it and when he told me that it meant “Dead Water”, I mentioned that I would have thought that the French for Dead Water would be something like L’eau de Morte. Ah, he smiled, it’s Dead Water in Occitan, not French. After seeing my blank look he continued and told me that Occitan was the French dialect in Southern France and was a different offshoot of the Latin language from that of French, spoken in the southern third of France, the northern parts of Italy and the northern parts of Spain. 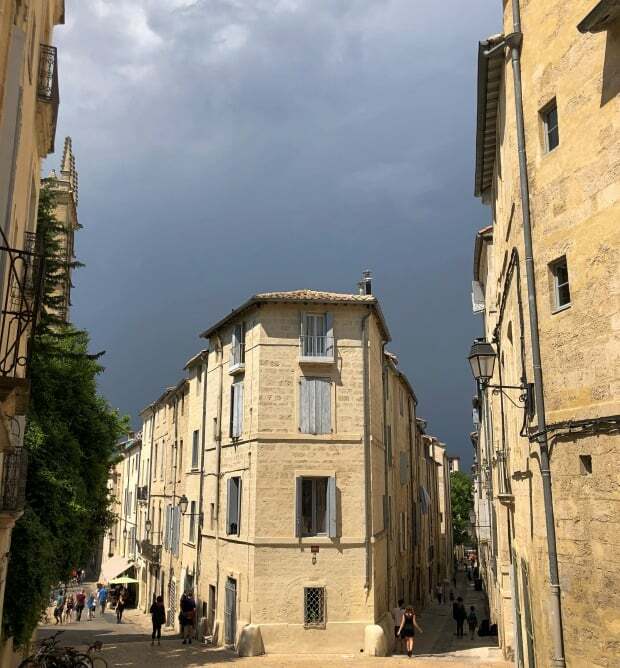 The penny dropped for me: Aigues-Morte sounded sufficiently like Agua Morte to make the leap that Occitan was kind of like a mix of Spanish and French. Arriving at the city itself we got out of the car and marvelled at the ramparts. 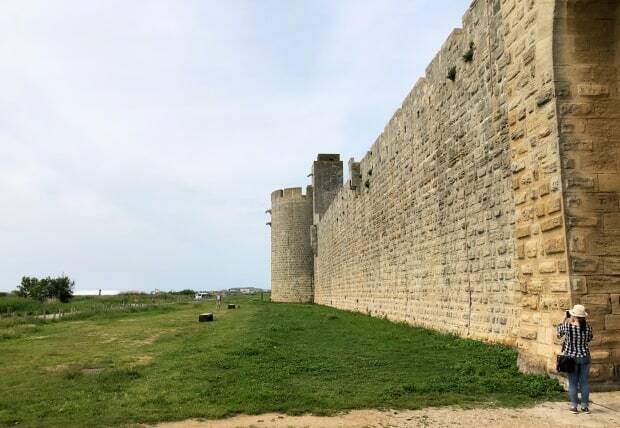 Built in the 13th Century, the medieval city boasts 1,650m of ramparts in a roughly rectangular shape and a museum allows access to the walkway on the top for a fee. Even though it was only €8 each, we didn’t really have time to explore the complete wall, and Chloe was in a stroller, so we moved on from the museum. The staircases spotted sporadically around the interior of the wall had been bricked up so that you can’t avoid the fee and get to the top at a different location. 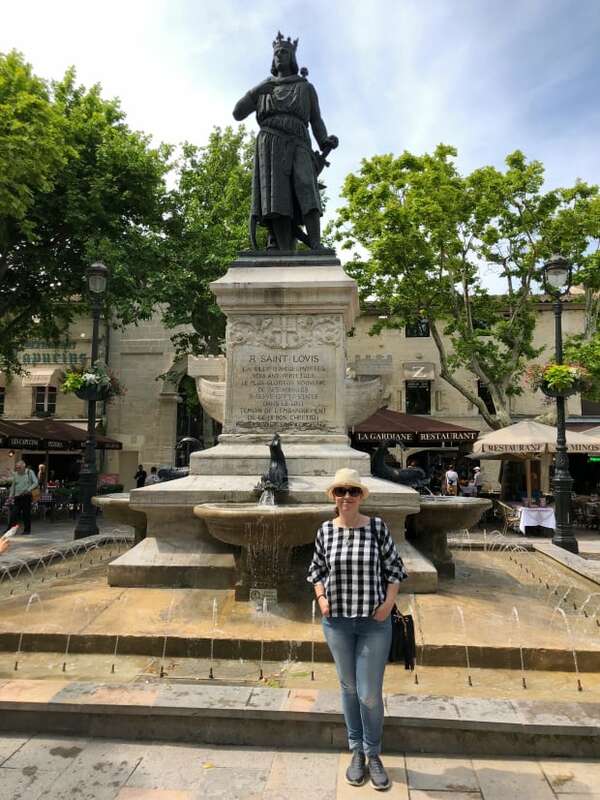 We did have time to grab a coffee in the main square and took a photo or two of the statue of King Louis IX, otherwise known as Saint-Louis: his connection to Aigues-Morte? In 1248 he had left from here for Egypt on the Seventh Crusade. On the way back to the car we wandered the streets. 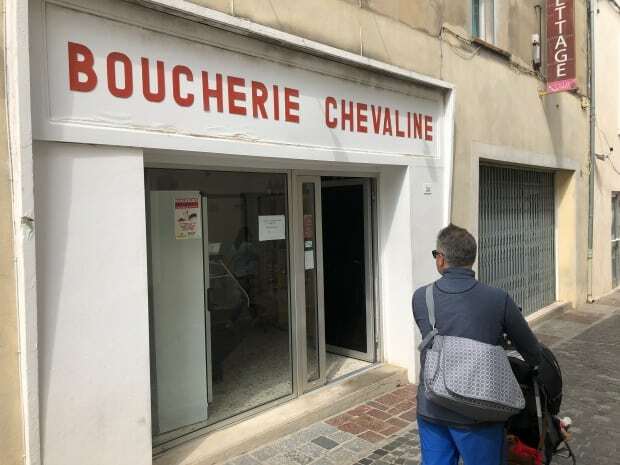 I was reminded of Venice – every other shop was a restaurant or sold tourist tat, and even the ones which didn’t fall into that pairing were focused on serving the visitor. As we left via the great medieval gate we marvelled again at the sheer size of the walls. Unlike Carcassonne, 2 hours to the west, the walls here were original and hadn’t been renovated in the 19th Century. A road train trundled by – not a bad way of seeing the complete circuit of the walls without having to walk around them all. On the way back to the AirBnB we noticed piles of white sand – actually it turned out to be salt. The same industry which the city had been built around: mining the salt from the salty marshes still continues to this day. In the afternoon we headed inland, away from the sea and up into the mountains above Montpellier. 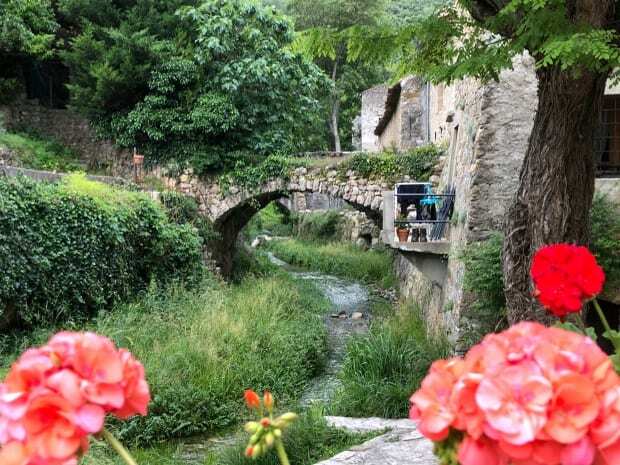 We were following the Herault River, stopping off at the small town of Aniane for a coffee on the way. We picked up some pastries from the bakery and took them to a cafe. I asked Steph if it was ok to take food bought elsewhere to a cafe, but he said it’s fine as long as you don’t leave your wrappers for them to clean up. Almost like it’s OK to cheat on the cafe as long as you don’t rub their face in it I guess. 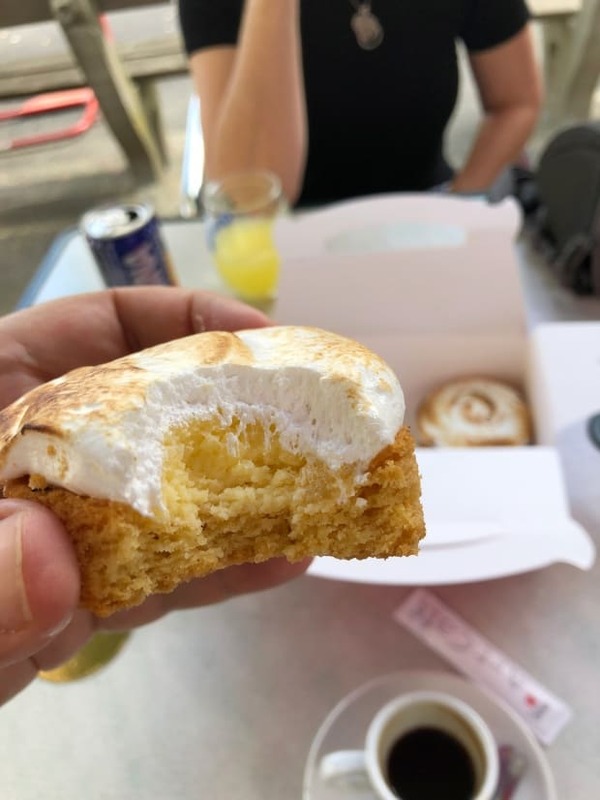 Anyways, we enjoyed our meringue mini cakes and washed it down with the local orange fizzy drink. Ange commented on the interesting shade of orange – different from the vivid colour of Fanta. I had the answer to that one courtesy of my brother who had lived in Italy. Apparently in the EU there were rules around fizzy drinks and that if they looked orange then they had to have a certain level of orange juice in them, and weren’t allowed particular food colourings or additives, which meant a slightly more natural hue. Anyway, suitably refuelled, we headed back to the car and onwards up the river into the hills. 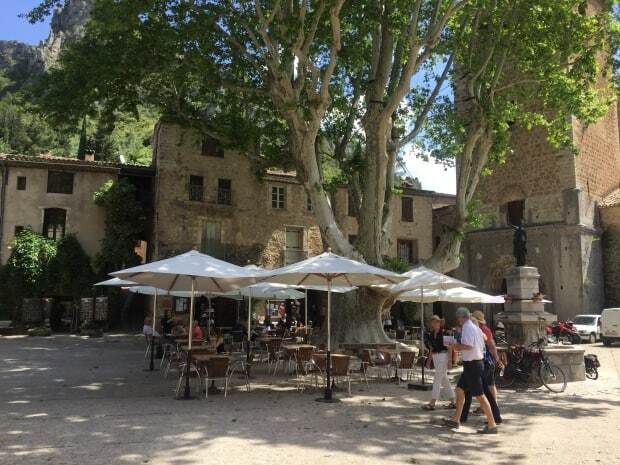 Saint Guilhem le Désert sits astride the Gellone river just before it reaches the confluence of the Herault River, and there is a carpark at the top of the town, allowing for a leisurely stroll down into town…and unfortunately a slightly less leisurely stroll back uphill afterwards. A central square with an enormous tree commands the village, with a couple of cobbled old roads snaking between suitably ramshackle medieval houses up and downhill alongside the river. Restaurants and tourist shops compete for attention on the periphery of the old square and a sizeable church lurks in the corner. We head over to the church and nosed our way through. The Abbey of Gellone is attached to the church via an internal cloister but when we make it to the entrance to the Abbey which houses the museum, it’s closed for lunch, so we retrace our steps and return to the central square for lunch ourselves. 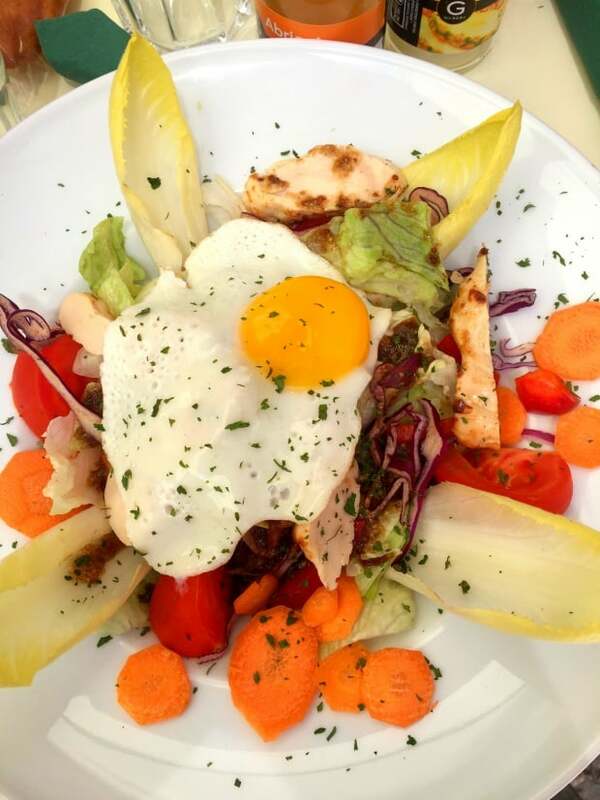 La Source is one of the restaurants facing onto the square and we browse the laminated menus before settling on what to eat. 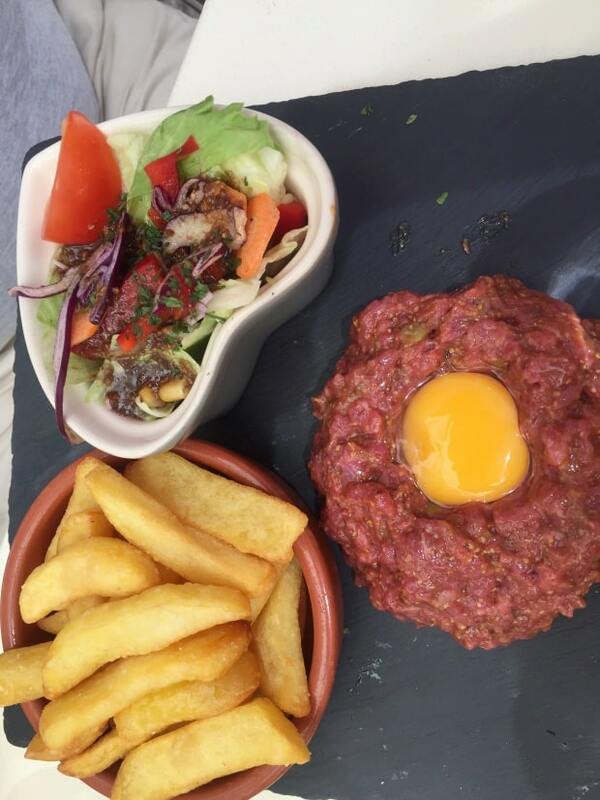 Steph elected for the steak tartare, and the other three of us elected to be healthy with salads. 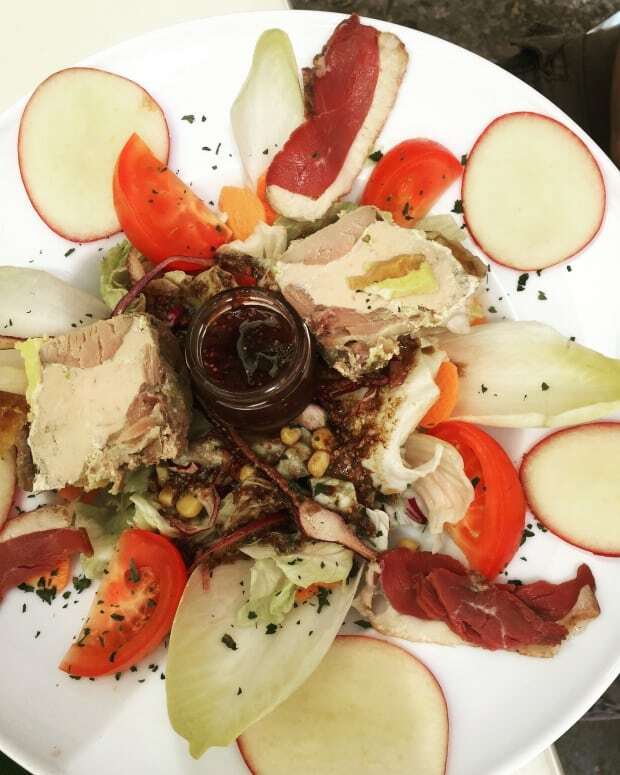 But salads can only be so healthy – Tania’s Salade de Fromage Roti included a whole roasted Camembert, my Assiette de Froie Gras featured foie gras and fig jam while Ange did the best with grilled chicken and an egg with hers. 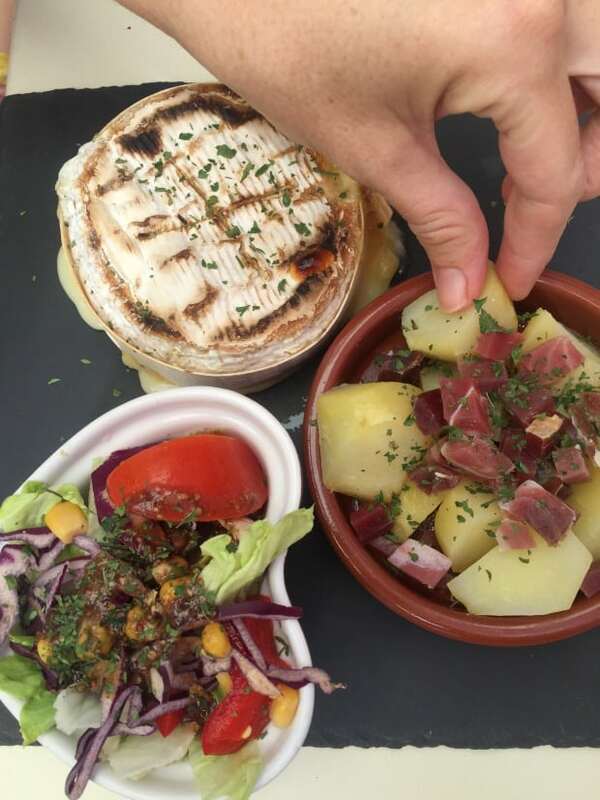 All tres delicieux, but I had to wonder how vegetarians get on in France! After lunch we succumbed to dessert, and a mixture of waffles, crepes and ice cream were dispatched with speed. My almond sauce on waffle sounded better on paper than it tasted, so I had super food envy on the waffle smothered with Chantilly cream. Mmmm! Ready for a nap, but cognisant of needing to see the rest of the town we went for a wander while we waited for the museum to open. We headed down hill, cobbled streets benign underfoot during the day, but looking like they’d be treacherous when the rains came. 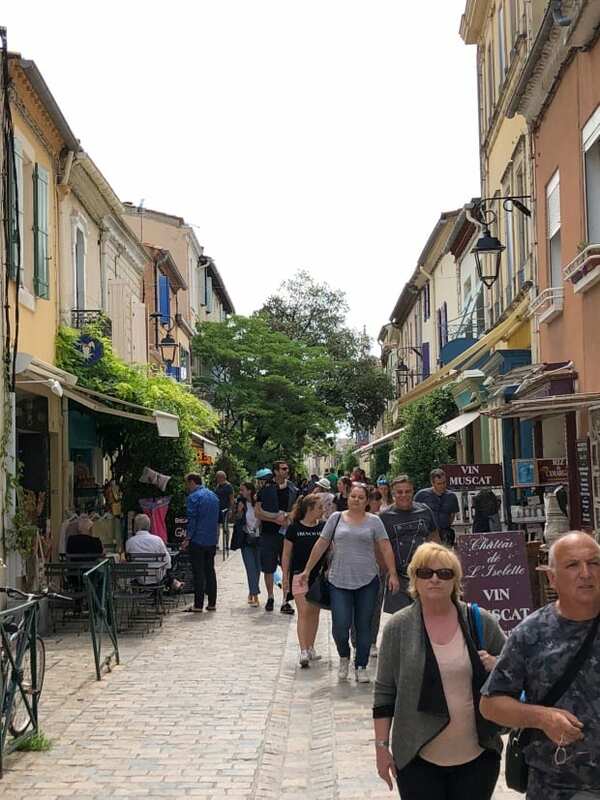 The streets were barely wide enough for a car and the houses and shops were all made from the same stone and in the same style so looking every inch the picture perfect medieval town. 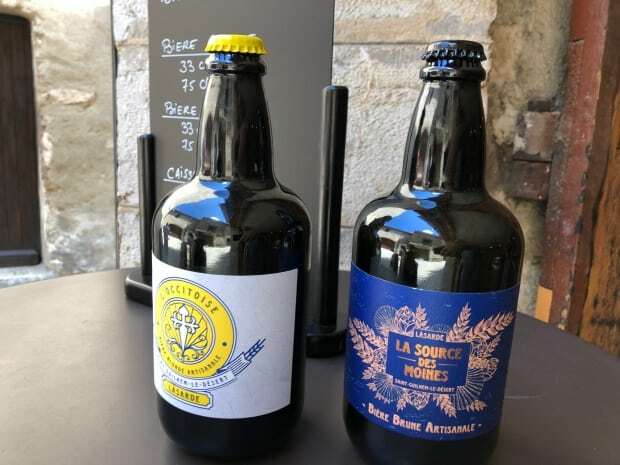 We nipped into a few stores to check out the local wares – a boutique brewery selling elephant beers made locally, a boutique honey shop selling royal jelly, honeycomb and mead amongst the standard honey and candles, plus a boutique shop selling boutique soaps and lotions. Everything was authentic and locally produced and well presented in stores tucked into the arches supporting the buildings. The shopkeepers (when the shop was open) would park themselves in the sun outside their shop and read a book or chat with their neighbours until one of the dozen or so tourists wandering the streets went into the shop, and then they would follow them inside in a relaxed manner and wait patiently at their till for the possibility of a sale. No pressure, very relaxed. As we reached the bottom of town and turned around to come back up, I noticed that there was a recurring theme through the town. Above the road two emblems hung from cast iron hooks, emblems repeated on doorways and in all manner of decorations through the town. They were a scallop shell and a stylized cross. I couldn’t figure out how the scallop shell could be the insignia of a town so far from the sea, halfway up a mountainous gorge. 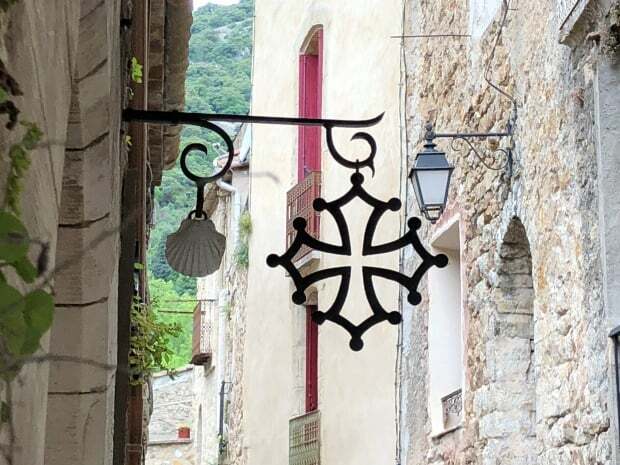 The stylised cross was easy – that was the emblem of Occitania, the French/Spanish region with its own dialect. Academics of course disagree (as they tend to) on the significance and meaning of the 12 dots on the cross. The mystery of the scallop shell was solved instantly by a quick google search. Back in the day there was a pagan pilgrimage route to the northwest corner of Spain – the Via Finisterre (the way to the end of the world) where pagans, Celts and others would travel to see where the sun disappeared. After the remains of Saint James were discovered in Santiago de Compostela, the pilgrimage route was taken over by Christians and renamed the Camino de Santiago. 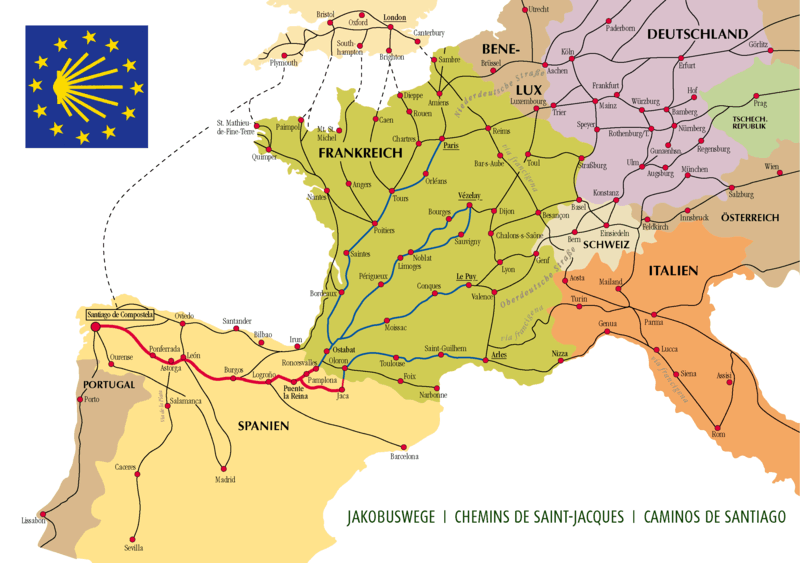 The different overland walking routes take many different ways to get to Santiago de Compostela but somehow the main route from Italy came through Saint Guilhelm. The symbol of the scallop shell is associated with Saint James the Great, and medieval pilgrims would be given a scallop shell upon completing the pilgrimage. Though I was also told that pilgrims would wear a scallop shell while on their pilgrimage too. Pilgrims were also given food and shelter for free on the route, and the shell would be their dish to eat from, their cup to drink from and also an indication of how much food they could have. People still do the pilgrimage now, some for religious reasons, some for pagan reasons and some just for the experience of doing a trek. Experiences are naturally mixed but I did read an entertaining story of one man’s experience on the route. 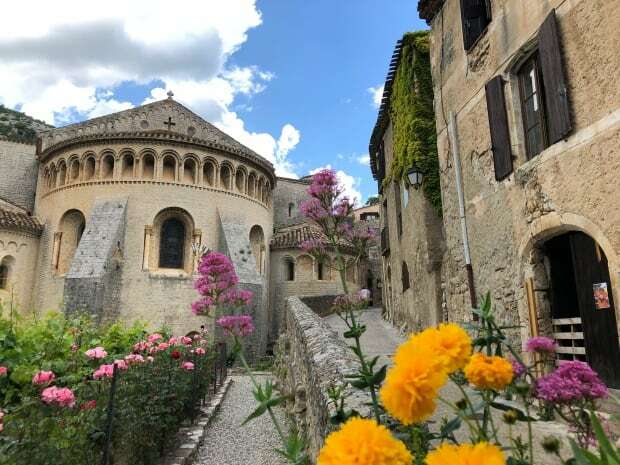 If you did find yourself in Occitania and wanted to visit Saint Guilhelm without a car, there are five buses a day which go from Montpellier via Aniane, (visit here for the schedule). 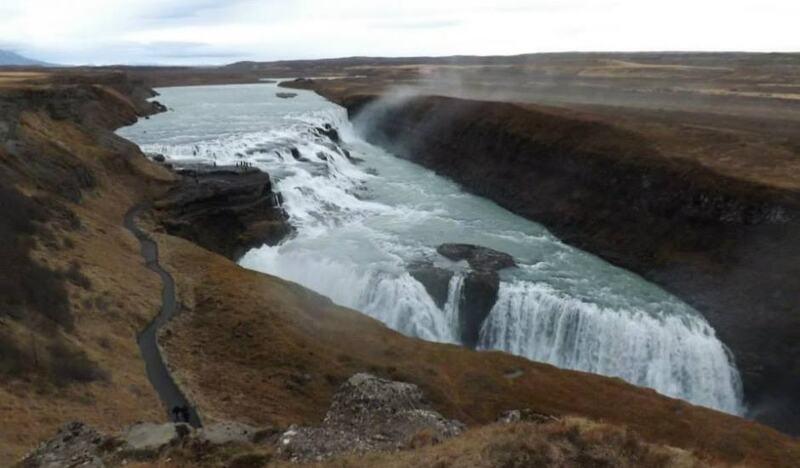 The local tourism board can also arrange tours for you with various combination of options. Suitably impressed by the authenticness of Saint Guilhelm, we briefly stopped off at the playground beside the carpark before heading back to Maugio. We hadn’t really explored much of Mauguio itself, and resolved to rectify this. I thought the small town to be built around a castle, stronghold or church, but any fortifications on top of the motte in the centre of the town had long since disappeared. Instead, a spiral walkway lead uphill through a garden to a clearing on top with views all the way to the sea. A tower with access to the water reservoir beneath the motte skewered the centre of the clearing. 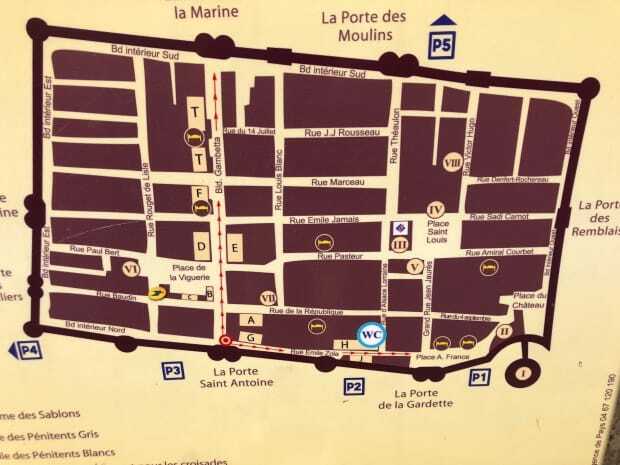 The roads leading from the Jardin de la Motte back to the open square in front of the town hall held all manner of shops including specialist butchers, one of which specialised in horse meat. 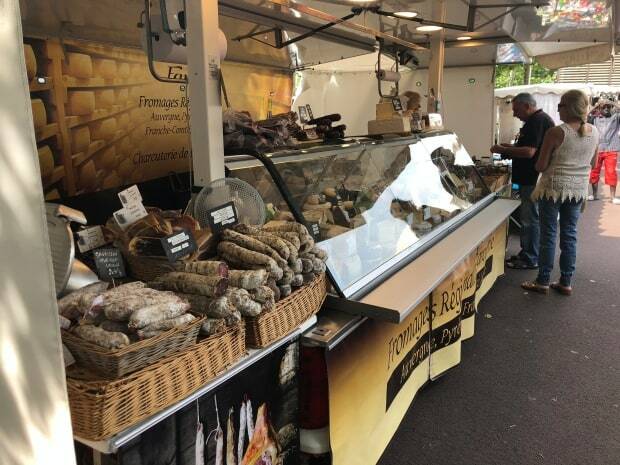 Apparently a big enough market to justify a whole shop! 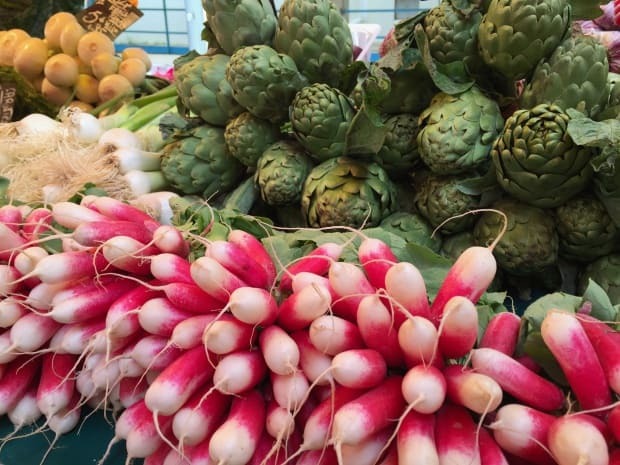 We spent a little more time in town, shopping at the local open air market, but then it was time to wander home. The route we chose came close to the arena where the bull fighting occurs. You can see the arena below. Despite these differences there are still protests against the sport, with Pamela Anderson being the highest profile American celebrity getting involved in recent years. 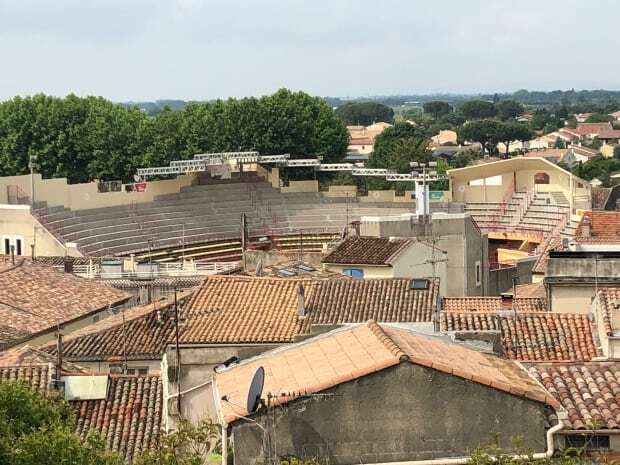 I find it interesting to see the different arguments against the French bullfighting – to hear the Guardian tell it, the bulls almost seem to enjoy attacking the players, and any sport where the animals aren’t killed or even damaged would surely be ok? 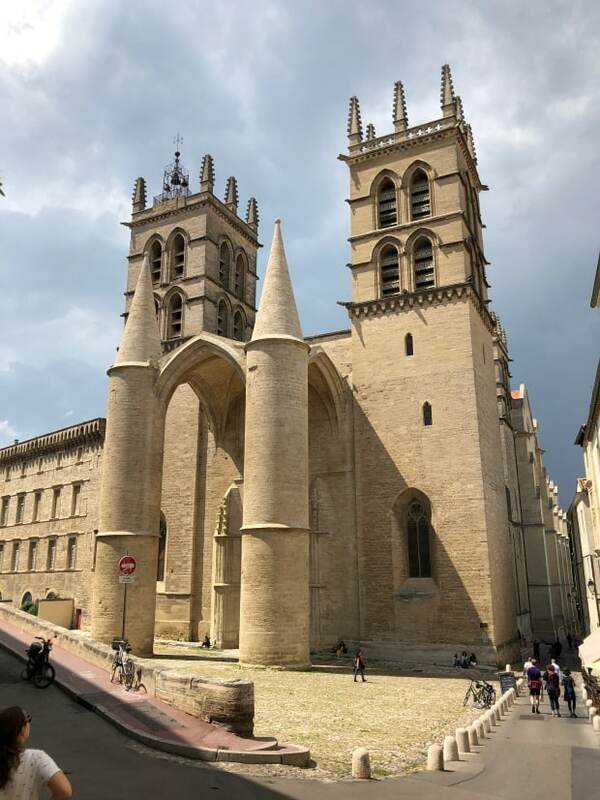 It was blisteringly hot when we headed into Montpellier to see what this University city had to offer. 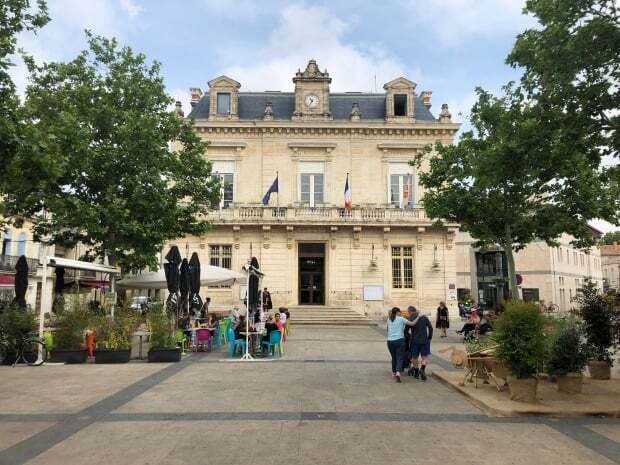 Three universities and three other higher education institutions meant that fully one third of Montpellier’s population are students. 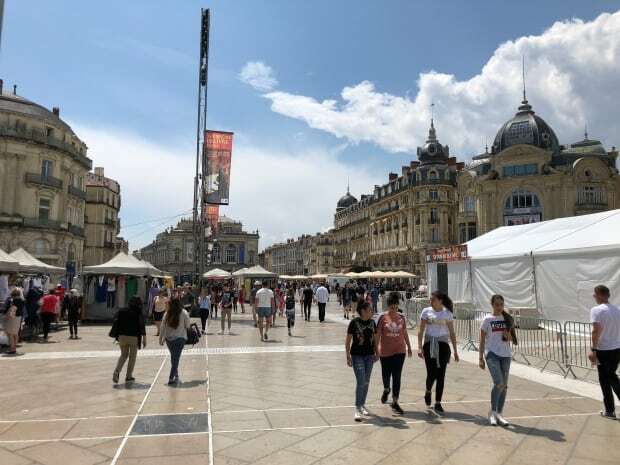 When we arrived into town there was a large market in the centre of the huge square between the Tourist Information Centre and the Opera House, and we wandered from shady spot to shady spot for protection. After the main square, we headed up well populated side streets, lead by Steph who kept a running commentary and pointed out the interesting shops and buildings. 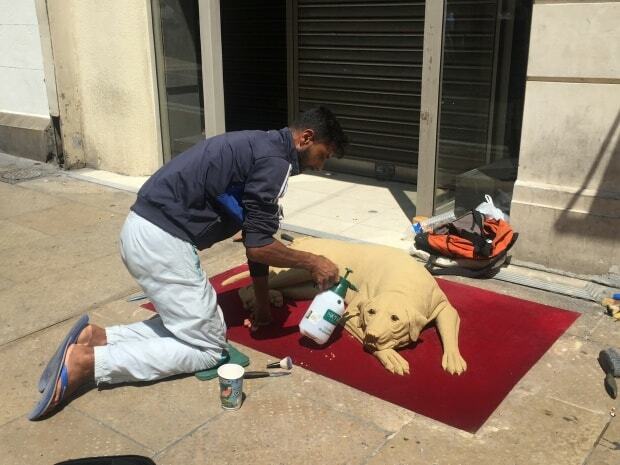 Steph gave a coin to a street performer who had brought sand with him and was modelling a photo realistic dog out of the sand on the street. He looked up with a grin and smiled his thanks before turning his attention back to his task. The dog was spookily realistic and I half expected him to leap up and bound away down the street. 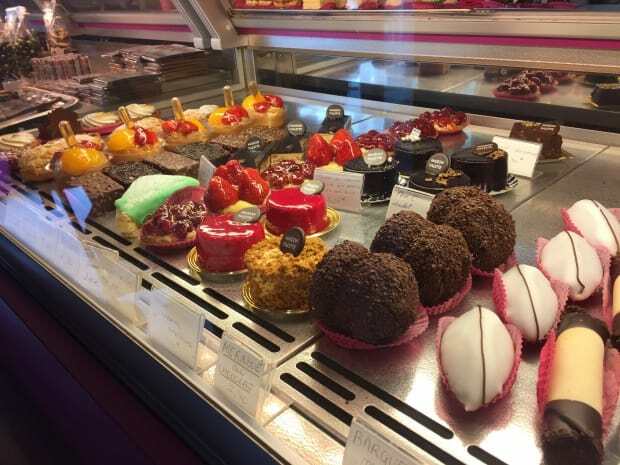 We paused briefly outside a chocolaterie and I marvelled at how, with so many delicious foods on offer, the French people weren’t obese. Mireille Guiliano, a French author, examined this in her book Why French Women Don’t Get Fat. One of the clues was in the size of the portions on sale. Easy to maintain your shape when the treats you have are tiny. 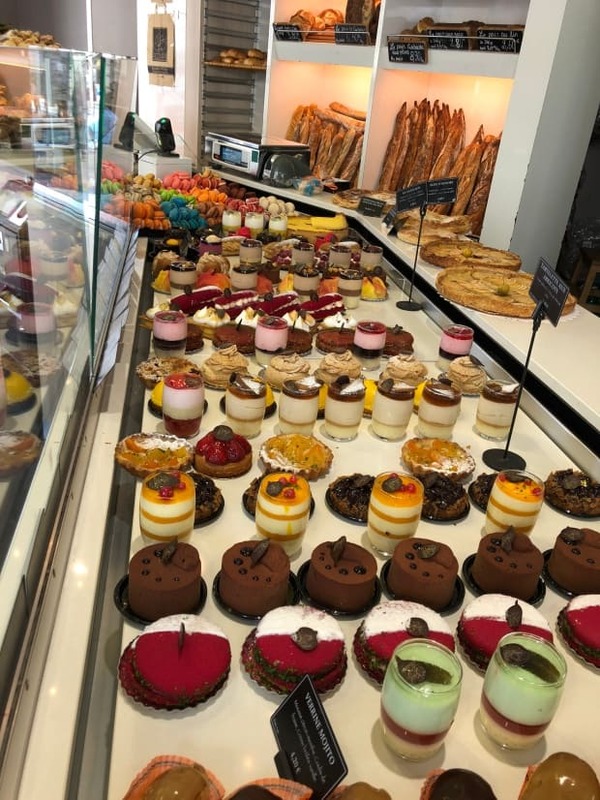 Montpellier is a truly charming city, and we enjoyed the twisting narrow streets as much as the broad shopping boulevards. I was taking a photo of a building built in the local yellow sandstone because the contrasting blue of the window shutter matched the colour of the sky. 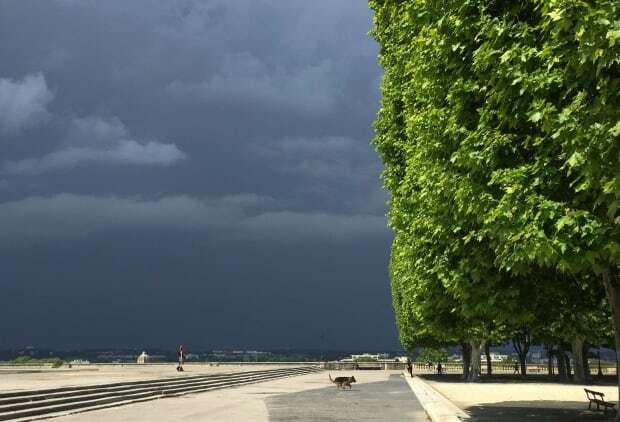 However, I realised that, while the sun was still out and bathing the city in sunshine, in the distance the horizon had turned black, and the shade of the sky I was trying to match was a dark and thunderous hue. Assured that it would take some time for the rains to arrive, we continued our tour of the city. St Peter’s Cathedral was built in 1536 and was used as a fort in the religious wars in the mid 16th Century, but due to the colour of the sand stone it looked nothing if not a castle made of sand. Surrounding the cathedral were buildings of the various universities and students carrying books or taking a football to the park for a kick around gave sharp contrast between the weight of history and the promise of the future. We came then to the golden entrance to the Promenade de Preyou. 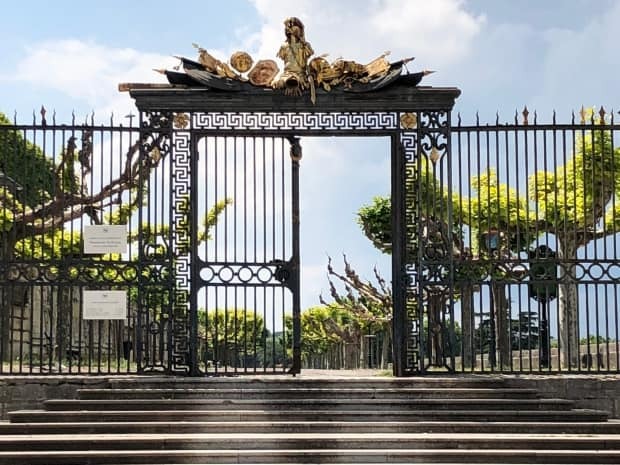 There were three entrances: two matching side corridors faced with marble stairs and grand cast iron gates atopped with golden armour allowed access to a long but narrow boulevard with stunted trees. While opposite the Arc de Triomphe the main entrance welcomed dog walkers, students and tour groups into the Promenade proper. 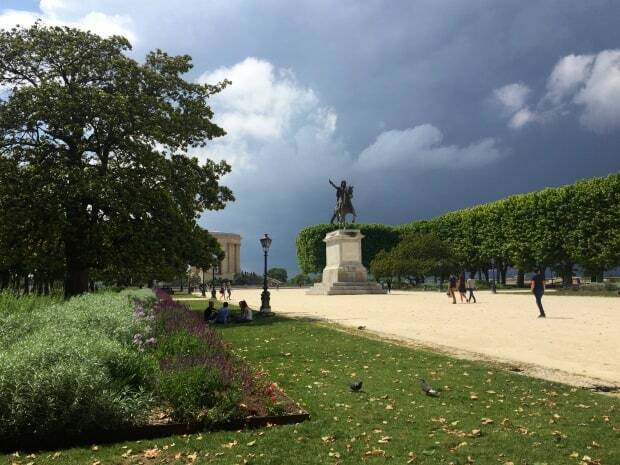 The main section of the Promenade was a huge plaza with a statue of Louis XIV in the middle of it. The central section of the plaza was bordered with matching wooded sections, impressive in their size and well used by a large group of students with all manner of musical instruments, enjoying the weekend sun. Beyond the wooded area was a dual level Roman aqueduct, blocked off from pedestrian access by an iron and glass gate. 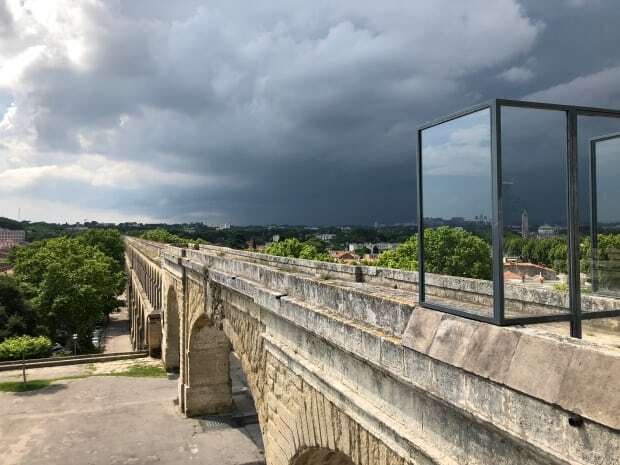 A chateau d’eau or water tower was built where the aqueduct joined the promenade and between that and the wooded area sat a large pond. The views across the city were amazing: doubly so now that we could see the extent of the thunderous rain clouds which were threatening. The contrasting colours of the yellow sandstone buildings of the city bathed in sunshine, the green of the water in the pond and the dark slate grey of the impending rain-clouds really crystallised the moment. 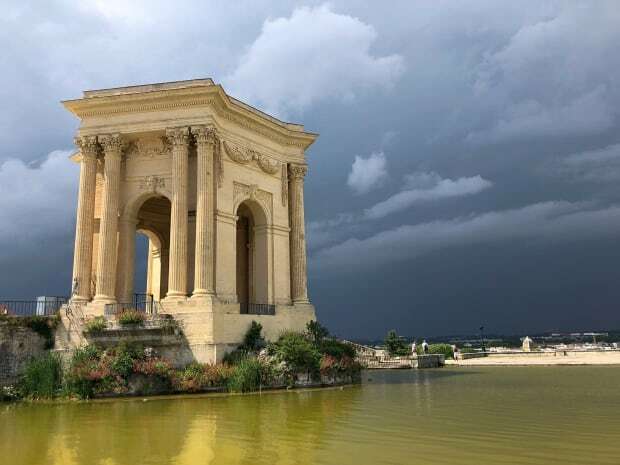 Now starting to get a little worried about the ferocity of the rain that was coming, we started to head back to where we had parked the car, pausing briefly to check out the triumphal arc the Porte de Peyrou (1692). Porte de Peyrou, Promenade de Peyrou, I was beginning to wonder who this powerful family of the Peyrou were. I found out later that Peyrou is Occitan for stony. We made good time, dodging other pedestrians and avoiding traffic and reached the main square via a pedestrian-only tree-lined street. The market was starting to dissipate, but there were still florists set up under umbrellas doing a good trade. We still had about ten minutes to go before we were at the car when it happened. Me being taller, I felt it first. A single, huge rain drop. “Uh… did anyone else feel that?” I asked, switching up a gear in my walking speed. Ange turned around frowning. “Feel what?” She said. A second later she said “Never mind” as we all as one accelerated to a run and dashed across past the shopping malls towards the car. In the distance thunder rolled as fellow pedestrians clogged the entrances to the malls. We could have joined them but were heading home anyways so thought we’d make it to the car and dry off when we got there. 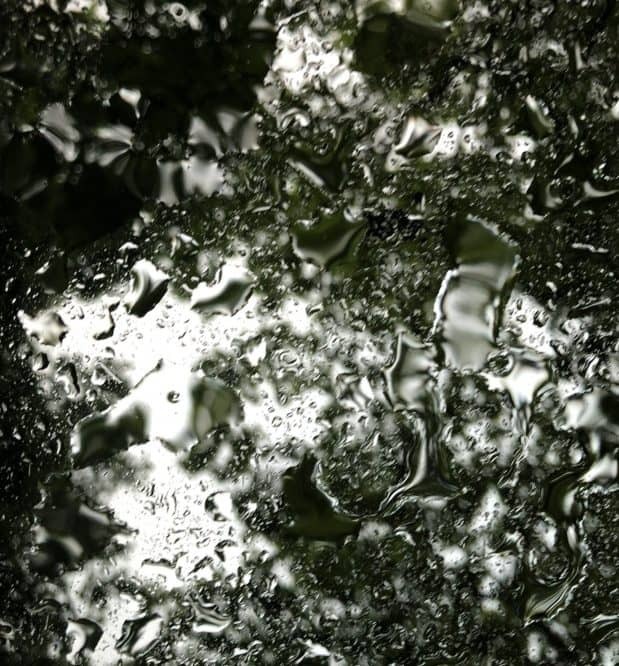 We were within sight of the car when it really started to come down, rain not so much falling as angrily pelting the ground as we packed up the stroller and gratefully climbed into the car after it. The rental car we had featured a sunroof. and it was strangely calming after the mad rush to the car to see the trees lining the roads pass accompanied by the monotonous thrum of the rain.